The fireplace in the living room plays a vital role in retaining the warmth of your home. Choose the right mantel to blend with your fireplace and the rest of your home decor. Fireplace mantels are also known as mantelpiece, mantel shelf and fireboard. Fireplaces are generally made from various materials, stone, wood and marble being the most popular choices among them. No doubt that the fireplace forms the heart and the soul of a warm living room. Fireplace mantles are available in a variety of options; choose the right one to make your fireplace look extra special. The right fireplace mantel can turn a drab corner into an interesting niche. Depending on the taste of the buyer, fireplace mantles can be made either in conventional or contemporary style. Apart from the basic fireplace mantle, accessories for mantles such as mantle shelves, over mantles, caps etc are available. Play around with these accessories to best advantage! Stone mantles are available in a wide choice such as sandstone, marble, granite, limestone etc, thus allowing a variety of options in color and quality. For people with an inclination towards antique forms of mantles, original antique mantles that once adorned living rooms of celebrated mansions, palaces and majestic old homes can be picked up in architectural salvage stores. An antique piece of mantel can be expensive or affordable depending on its condition, material used and where it has been extracted. The mantles might need minor revamping before installation and professional carpenters are the best bet to fix it without causing any damage. 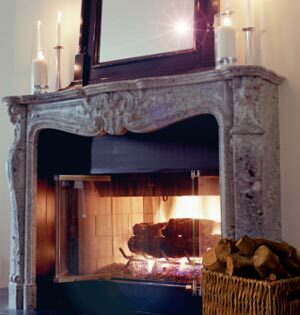 Wooden mantles are the next widely chosen material for mantles and work out a little cheaper than the stone ones. Wooden mantles are mostly made from oak, maple and cherry wood. They are easy to fit in when compared to the rest. Wooden mantles can be painted or varnished as per the choice of the homeowner. The latest trend is cast stone mantels and they can be custom-made to fit your fireplace perfectly. Cast stone mantles are heavy but much lighter when compared to other types of stone mantels. They can be made plain, sophisticated or striking depending on the choice of the buyer. Stone mantles lend a wonderful ambience to your living room. They blend with any kind of furniture. Cast stone mantels can be made to the color and size of your choice so that they complement the overall décor. Wooden mantels are simple to install and hardly need any professional help. Wooden mantels made of oak enhance the beauty of the room. Wooden mantels have been in use since the Victorian era and are a class apart when it comes to beautifying the interiors. Wooden mantels may be troublesome as they are easily combustible and may need additional safety measures. Check with the safety department norms and the builder on how far the mantel has to be placed from the fireplace to avoid any undue incidents. Some wooden fireplace mantels may not go well with contrasting wooden furniture. Stone mantles are heavy and cannot be fixed without professional help. Stone mantels are expensive depending on the type of stone you choose. Initially fireplace mantels were used for cooking and heating purpose alone but now mantels play a major role in contributing to the décor of the room. The fundamental of a fireplace mantel is its color, texture, size and how well it fits in the existing atmosphere. Fireplace mantels can be decorated to suit festive themes or seasonal changes too. Choose the right wall hanging or picture to be hung either atop the mantel or placed on top. Huge mirrors and family photographs too make for a wonderful background on the fireplace mantel. Providing sufficient lighting for the background would do well to bring focus on this area. Place the mantel so as to complement the room decor. You can choose from symmetrical mantels or even asymmetrical ones. Rich metal braces provide the fine touch to rich wood fireplace mantels. When choosing cast stone mantels, allow pieces of marbles to be mixed and showcased, they give the entire mantel a unique look. First Published Date: Jan 8 2007 Last modified Date: April 18 2019 This page may have been updated recently as new information is available or the content may have been edited for better readability.